These Gluten-Free Vegan Oven Baked Zucchini Chips are a great alternative to chips or other unhealthy, processed snacks and are not only vegan but gluten-free, grain-free, flourless and oil-free too. You could make them in the shape of chips as shown, or even as zucchini fries by cutting them into long strips instead. They’re really addictive and have a spicy, cheesy taste to them. 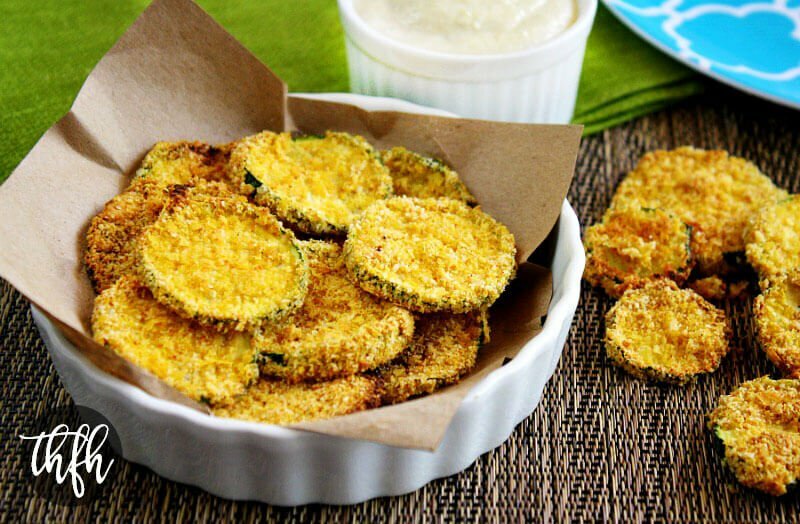 If you’d rather another zucchini chip alternative, try my Lemon Dill Zucchini Chips or if you’d rather another oven baked snack, try my Healthy Oven Baked Green Tomato or Gluten-Free Vegan Oven Baked Okra Bites recipe. And, if you’d like a healthy dip to go with them, pair it up with my Smoked Paprika Habanero Sauce or Creamy Vegan Cilantro and Lime Tahini Dressing. This easy, healthy snack is vegan, gluten-free, dairy-free, egg-free, grain-free, flourless, oil-free and paleo-friendly. Want more healthy snack recipes? Check out Vegan Cheesy Baked Kale Chips, Gluten-Free Vegan Oven Baked Avocado Fries, Vegan Oven Baked Chipotle Jicama Fries with Creamy Cilantro Lime Sauce or my Clean Eating Cookbook with an entire chapter of 20 healthy snack and side dishes just like one that you will love! Tip #1: These are best served hot, straight from the oven and will get soft once they cool off. Tip #2: I sliced the zucchini ~with~ the skin on but you can remove it if you prefer. Tip #3: I like mine extra spicy so I add a little extra cayenne to my mixture but just adjust the amount to your preference. Tip #4: Although I don’t do this every single time I make these, you can grind the large flake nutritional yeast in a coffee grinder to give it a fine “Parmesan Cheese” texture if you prefer. Sometimes I just use the large flake and skip this step. Add all ingredients for the seasoning to a small bowl and stir until combined. Adjust seasonings to your preference. Set aside. Slice the zucchini in 1/4 inch slices. Start an "assembly line" with three bowls: one for the sliced zucchini, a second for the almond milk and a third with the seasoning mix. Have a baking pan ready, lined with parchment paper at the end. Dip each slice of zucchini in the bowl of almond milk, then the bowl of seasoning mix (flipping it over to cover both sides) and then place onto the baking pan. Repeat this step for all the zucchini slices. Bake at 425 degrees for approximately 15 - 20 minutes, or until golden brown. Best served hot from the oven. The recipe and photographs for "Gluten-Free Vegan Oven Baked Zucchini Chips" by Karielyn Tillman of The Healthy Family and Home website are licensed under a Creative Commons Attribution Non-Commercial No Derivatives 4.0 International License and cannot be used without my written permission. These were great! My mom loved them! They’re definitely a new staple for us. Thanks so much. 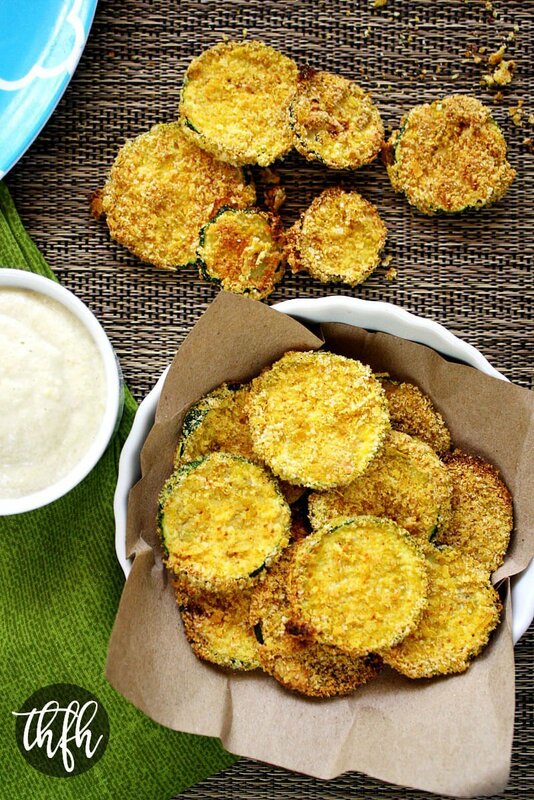 I’d love to try this Zucchini Chips recipe. I noticed it called for bread crumbs. I am just starting with a Gluten Free diet. Do you know how I could do this gluten free? Hi Annmarie! I actually was just getting ready to revise/update this recipe because in the time since I posted this recipe, I have also been trying to do gluten-free. I just posted a recipe for Healthy Oven Baked Green Tomatoes yesterday using almond flour and homemade almond milk instead of breadcrumbs and coconut oil. I also have some fresh zucchini, so today I will try it with the gluten-free ingredients to make sure it works. I’ll update the post and recipe today if it comes out good. And that’s what I’ll be using going forward because it was really good with the green tomatoes. Hi Annmarie! Ok, I re-made them with the almond milk/almond flour combo and they were great! I just updated the recipe and photos and they are now vegan, gluten-free, grain-free and flourless.